Our rare, certified organic Kiawe Honey is gathered from an isolated Kiawe forest on the island of Hawaii. 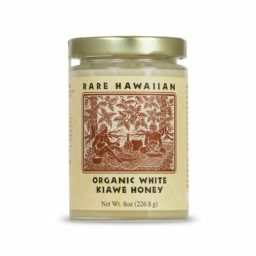 Pure Kiawe Honey rapidly and naturally crystallizes into an exceptionally creamy texture, creating a pearly white honey with a unique, delicate tropical flavor unlike anything you have ever tasted. Available in 20 oz., 8 oz., and 3 oz. sizes. Choose an option3 oz.8 oz.20 Oz.